Did you know that as a BC Hydro ratepayer you are subsidizing projects like the Kinder Morgan pipeline and tankers proposal and LNG Canada? 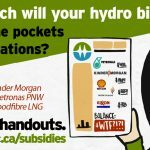 The BC government is offering handouts to the LNG industry in an attempt to lure companies to BC in adverse market conditions, and it’s us the taxpayers and hydro ratepayers who will be footing the bill. Watch this video to find out how your rising BC Hydro bill pays for handouts to international corporations. This is a bad deal for BC. 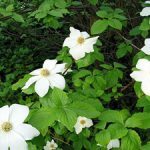 Not only would Kinder Morgan and LNG development destroy our climate and put our water at risk, not only would the $9-17 billion Site C dam flood some of the best agricultural land in BC and trample on First Nations treaty rights, but it’s you and me who are going to have to pay for it, for generations to come. British Columbians need to know just how bad a deal we are being sold. Let’s get the word out. Thanks to Corrina Keeling for producing this video! These alarming increases in our hydro rates are because the BC government made a reckless gamble on liquefied fracked gas, against all odd and seemingly at any cost. We’ve outlined how this is happening in a new report, Hydro Bill Madness: The BC Government Goes for Broke With Your Money. The report shows the BC government is offering subsidies to LNG and fracking companies in the form of tax cuts, royalty credits, and below-cost power. Taxpayers and BC Hydro ratepayers could be left with the bill for hundreds of millions of dollars per year. And because fracking and LNG require a lot of power, the BC government decided to build the Site C earth-fill dam, an expensive dam that is not needed for current electricity demands and that will contribute to escalating hydro rates for over 70 years. It all adds up to a very big bill that British Columbians will have to pay, and it doesn’t end there. Kinder Morgan’s Trans Mountain pipeline, if built, would be powered with subsidized energy at a cost to ratepayers of $27 million per year. Each time you pay your hydro bill you’re giving a handout to international corporations. It doesn’t need to be this way. Alternative energy sources such as wind, solar and geothermal create more enduring employment while providing a more flexible and cost effective avenue for addressing BC’s future energy needs. We can choose a different future for our province and our hydro bills. Ask your candidates where they stand on these issues and vote in the upcoming election on May 9. Volunteer with Sierra Club BC to help more people learn about the environmental and economic impacts of LNG, fracking, Kinder Morgan and the Site C dam.